Left to right: Haman Cross III, Terreon Collins, Azadi Sol, Brandon Love and Alexie Young pose for portraits during Gallery Night at the Homan Square Community Center. Photo by Pat Nabong. Artist Alexie Young lives in North Lawndale and works in North Lawndale. But she thinks something’s still missing from that equation. Gallery Night was a step forward in that direction, said some North Lawndale artists who exhibited their work during the event on March 28. Held at the Homan Square Community Center (3517 W Arthington St., Chicago, IL 60624), the pop-up event featured paintings, jewelry, masks and illustrations that were created mostly by North Lawndale residents. The event was organized by The Foundation for Homan Square and North Lawndale Community Coordinating Council (NLCCC), which drafted a quality of life plan that was released earlier this year. The report outlined strategies to nourish the community’s arts and culture scene. The annual Gallery Night, which is now on its third year, is one of them. 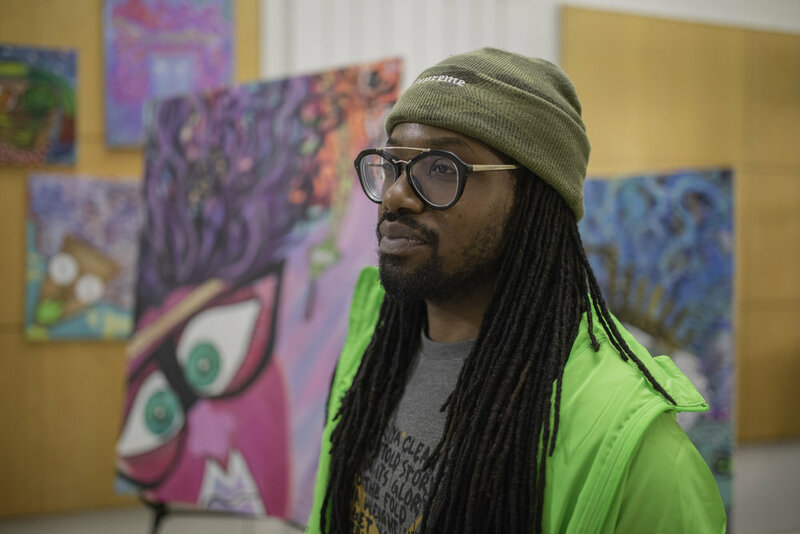 For many of the exhibiting artists, the event was a place to not only showcase their art but also to earn revenue at a low cost — an opportunity that artists like Brandon Love hope becomes more abundant. Besides Gallery Night, other art resources are emerging, according to some North Lawndale artists. Organizations like The Foundation for Homan Square, SAIC, Chicago Park District and Lawndale Christian Health Center provide resources for artists and art enthusiasts in the community, Sol said. Despite existing efforts, many still think that there’s room for growth. At Gallery Night, The Real Chi talked to some North Lawndale artists about the value of art in their lives and the role that art plays in the North Lawndale community. Alexie Young is an artist who is working on a series of paintings that explore the different ways women heal. Art has a huge impact on the narrative that is shaped in communities [like] ours especially through a very critical developmental period. When we look at other neighboring communities, and we see them as more affluent or our perception of those areas seem to be more hip, more well-developed. They often have cultural amenities that include arts of all kinds. … There’s something about being [in] a place where you just see beauty, but also you can understand that there’s deeper messages that are being conveyed, whether that’s through art, music or other forms of artistry, and I think North Lawndale recognizes that we could use this as a means to sculpt a healthy, beautiful neighborhood that celebrates the people that live here. Oh my God, art can heal this community. Art can definitely change some lives. I know we have a lot of talented artists because I work with a hundred students a day. ... I can only imagine some of these other individuals in the community that maybe are not expressing themselves artistically and can definitely contribute to our neighborhood, making it more beautiful and also just showing people that North Lawndale is more than what people think that it is … [and] whatever the stereotype may be. Azadi Sol is an SAIC artist-in-residence at Nichols Tower. Sol teaches acting at North Lawndale College Prep and uses visual and performing art as a form of therapy. As a kid I grew up writing poetry, and I knew that that was something that, for me, was a life saver. It kind of saved me from my community and from my trauma and my own personal struggles. ... Art is a way to activate your humanity and really to show people who you are without saying a word, show parts of yourself, and I think it's important for the North Lawndale community because there's so much trauma and so much happening in the community where people have to either feel like they have to be kept quiet about that or they feel like they don't have the necessary outlets to really speak to those issues, and so I feel like art is a great way to give people an opportunity to speak loud and clear about how they feel without having to be punished … especially in a community where talking about your issues and your socio-emotional shortcomings and your upbringing and your own traumas is almost a stigma … in Black or Brown communities, so having art therapy, trauma therapy is really important for people who almost have been silenced by their own community. Terreon Collins is a senior at DRW College Prep and wants to pursue a career in the arts when he graduates. Haman Cross III is a mixed media artist who teaches at KIPP Ascend Middle School and at SAIC. Cross said he uses art to express what’s in his subconscious. We always talk about [how] we want our world to be better, and I think in order for your world to be better or more, you have to make it better. You have to make it more. Now when you use the word “make,” … you’re talking about creating — that’s art. That artist is creating, is making, is bringing in something into form like bringing something forward, so I think ... in our communities we have to have practices and experiences that encourage and create possibilities.